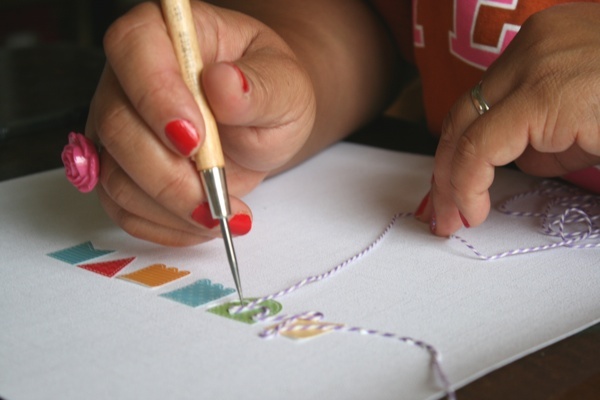 If you are like me, you LOVE the rainbow of colors offered in the Doodlebug Design collections --- doodle twine included. And, if you're like me, you might be stumped at ways to use all those cute colors of doodle twine. Today, I'm going to show you how to write with doodle twine. Yes, write. It is super easy to do with the simplest of products. Once you have your supplies gathered, you'll need to decide on a word to write. For this tutorial, I chose SUMMER as my kiddos' will be enjoying summer vacation in two and a half days. Summer, already. On that small scrap piece of paper, practice writing your word. It's just get a feel of how you want it to look and to use as a visual reminder. You'll use liquid glue to write a few letters at a time. Now, take your doodle twine and start following the glue lines as if you were writing with a pen. You are using glue and it will be sticky, so have an awl, paper piercer or stylus handy to help hold the twine to the paper. Continue with the glue and twine until you've completed writing your word. 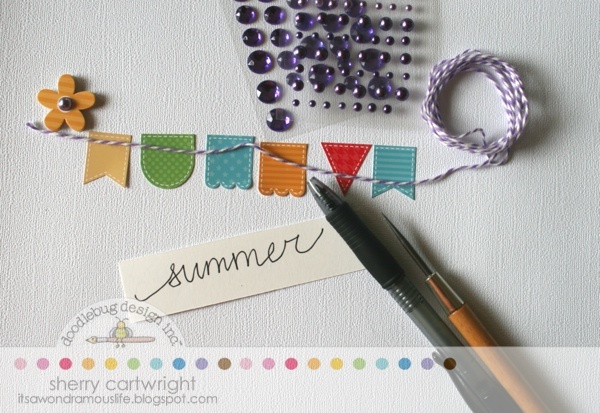 Once you've finished writing your word, let glue dry a bit, then add embellishments. I used a doodle pop flower sticker and some adhesive pearls to dress up my word. So, push your creativity and show off your handwriting -- in twine. Next up, you could even try the same with adhesive pearls and rhinestones. How about writing a letter or a word with a line of mini brads? If you try twine-writing or use doodle twin in your crafty creations, please share with us. We'd love to see your work. This is so cool, thanks for the tutorial! Awesome tut Sherry, I think this was genius! Love your tutorial on writing with twine. Great idea and so fun. Thanks for sharing.